Buy BioGaia probiotic tablets - Use regularly for good gut health! Special Offer – Buy 2 bottles of childrens probiotic drops, receive one packet of adult probiotic tablets for FREE!! Buy 2 bottles of probiotic drops, receive one packet of probiotic tablets for FREE automatically! 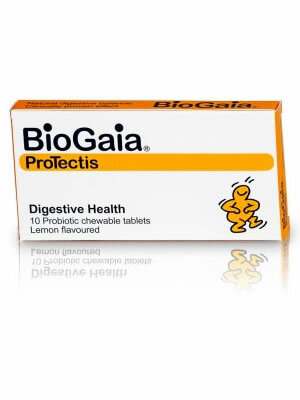 BioGaia ProTectis chewable tablets are a dietary supplement containing Lactobacillus reuteri Protectis. Really help with windy tummies in adults and children. Some parents give them to older children who can chew as they taste nice so it’s an easy sell to a usually stubborn tablet taking bunch! They have great results with constipation also. Will benefit anyone with most digestive issues. 1-2 tablets per day. One tablet consists of a minimum of 100 million live Lactobacillus reuteri Protectis. Use regularly for good gut health or when temporary stomach discomfort occurs. HappyTummy was set up by a qualified nutritional therapist, Sinead FitzGerald, who became very much aware of the benefits of probiotics during her time during her time working on her dissertation.